De Profundis is a hand-picked vocal ensemble that performs continental Renaissance polyphony at the original low pitch, using the all-adult-male forces appropriate to the period. Click on the tabs above to find out more about the group and about our programme of concerts. Our next concert will be on Saturday 4th May 2019. We’ll perform a programme of music by Juan Esquivel, one of the last of the great Spanish polyphonists. 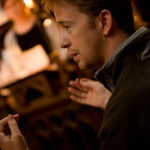 The conductor will by Eamonn Dougan who sings with I Fagiolini and The Sixteen, of whom he is also Associate Conductor. Then we’ll take the programme into the studio and record our third CD. 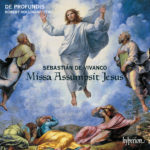 Our new CD of music by Sebastián de Vivanco, conducted by Robert Hollingworth, was released by Hyperion on 29th June to critical acclaim (“Sensational… immensely moving” – Record Review, BBC Radio 3). The programme includes his 5-voice Mass for the Feast of the Transfiguration (Missa Assumpsit Jesus) and a selection of motets. 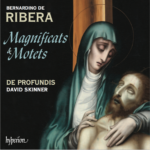 There’s also a world premiere recording of the Magnificat primi toni. You can have a listen to a couple of the tracks on our Soundbites page, and buy from Amazon.co.uk or iTunes. (Don’t forget to click on ‘View in iTunes’ to get to the page for ordering). You can also have a look at the album’s page on the Hyperion website here. To keep up to date with De Profundis news, concerts and events you can either sign up for our mailing list, follow us on Twitter or ‘Like’ us on our Facebook page .